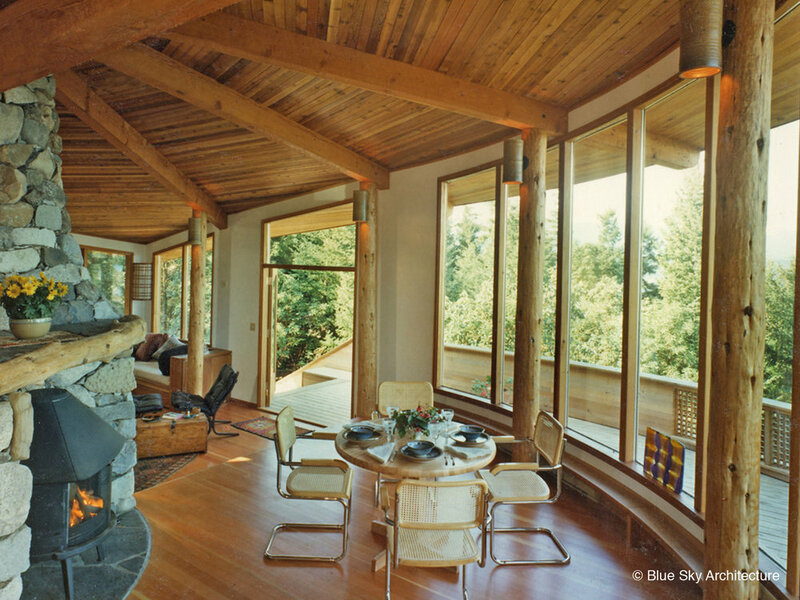 Eschewing consistency for the possibilities of the site, this organic residential design is a dance between conventional wood framing and exposed post and beam construction. Indigenous woods are used: Douglas fir, red cedar, and yellow cedar. Fine millwork is finished in American cherry. Local granite and sandstone are used in the masonry fireplace and for the house’s skirted base. An early landscaped or ‘green’ roof was a key element in visually marrying house to hilltop. Respecting the daily rituals of clients who had become friends, a progression of inhabitation steps down the hillside through the house as each day passes. Breakfasts and morning chats usually take place in the corner adjacent to the kitchen. Summer afternoons are spent on the uphill, sheltered terrace and flower garden, with sunset evenings in the dining room. As the day finishes, the owners use their mountainside perch to moon-gaze, then nestle into chairs in front of the monumental fireplace. In ensuing years the house has continued to grow organically with the client’s extended family; first a studio was built, then the guest area expanded, and finally an autonomous additional guest suite was added. 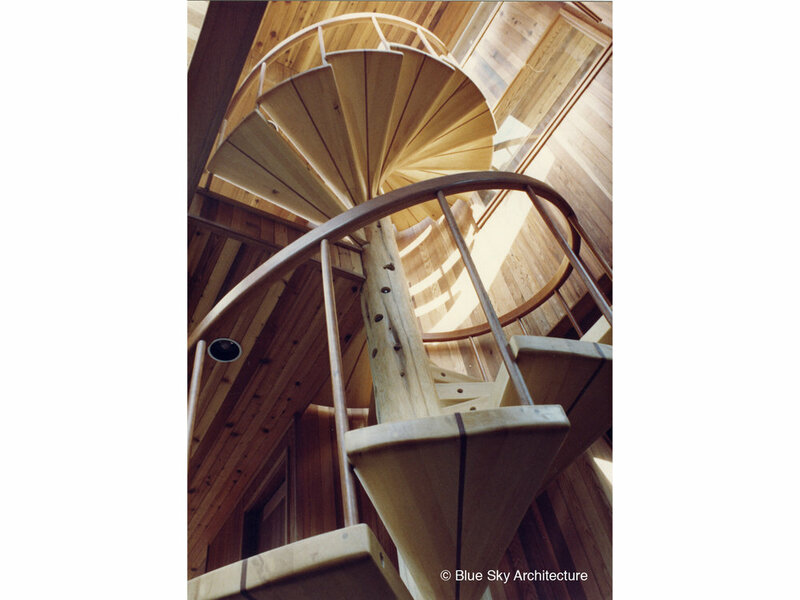 In order not to impact the existing house and its spiral-generated views, each addition extended to the north. Like parent with child then grandchild, the house’s elaborations further interrogated into the landscape while taking advantage of site opportunities of topography, views and light.